A while back I shared the story of how Mike and I got together. As part of this story, I included that Mike "decided to keep pursuing me" even after I told him I didn't want to date anyone. I want to dig into this a little bit more today because I've shared our story a few times recently, and I realized that this aspect of the story could easily be misinterpreted and perpetuate some incredibly problematic cultural views about relationships. This concept was first brought to my attention by the fantastic book The Gift of Fear by Gavin de Becker, which I've mentioned in previous posts. Essentially, de Becker points out that movies and television shows tend to glorify "persistent" men -- those who, having been rejected by (almost always) a woman, go to great lengths to show their intense love for her. In these plot lines, the guy who is unwavering in his focus on a particular woman and committed to displaying his affection for her eventually ends up "winning over" the girl. In real life, we call this stalking. Or, in a less extreme case in which the two people are already friends when the declaration of love is made, this can manifest itself in what's sometimes called the "Nice Guy" syndrome (though there are definitely "Nice Girls" as well). This is the guy who, having invested a lot of time into being a good friend to the woman he's interested in, feels that she now owes it to him to date him regardless of her actual feelings for him, and may try to argue her into doing so if she tries to turn him down. These are scary situations for a person to be in, since the other person has made it clear that they are unwilling to hear "no" and are willing to cross the boundaries of the person they're interested in to get what they want. And when persistence is not rewarded with reciprocal love the way the movies have promised, infatuation can turn to violence frighteningly quickly. For these reasons, I worry about someone hearing my and Mike's story and getting from it reinforcement of the media message, "Persistence gets the girl." I want to break down why I feel like our story is different from those that are glorified in on-screen plot lines and dangerous and problematic in real life. When I told him this, he didn't try to argue with me about it, and he didn't make any sort of declaration of love and try to tell me to give him a chance because he wasn't like other guys. He asked me some questions about my decision, and then he left it at that. In fact, he waited so long to say anything to me about his feelings that not only had I developed feelings of my own for him, but I was getting a bit impatient for him to make a move. The main reason I didn't go ahead and "make the first move" myself was the same reason I had decided to stay single in the first place: I had spent most of high school pursuing, and getting rejected by, different guys, and I didn't want to go through that ever again. Even though Mike and I were, at that point, practically dating -- spending a lot of time one-on-one with each other, having late-night conversations every night, doing favors and making gifts for one another -- I still was not convinced that someone could genuinely be interested in me enough to want to date me. When he finally did share his feelings for me, it was in the most low-pressure way imaginable. Far from being the Nice Guy who feels entitled to reciprocation, he was very adamant that he didn't want to pressure me into anything and that if we were going to be "more than friends" we could take it really slowly. Rather than stepping over my boundaries, he took them as law. I didn't want to kiss until my wedding day -- done. I didn't want to use the terms "boyfriend" and "girlfriend" because of past issues about the assumed entitlements that come with those terms -- done (until it became impractical not to use them). I can see how some people could look at our story and say, "You said you didn't want to date anyone, and he ignored that and asked you to date him anyway." But it really wasn't like that, or at least it felt nothing like that. By the time he finally said something to me, it was less of a sudden declaration of love and more of a "defining the relationship" kind of conversation. And I believe that if I'd reiterated what I'd said before -- "I genuinely don't want to date anyone or get married, ever" -- he would have accepted that and either continued our friendship or, if it was too hard to get over me because of the close relationship we had, requested that we spend less time together. Clearly, I'm happy things turned out the way they did, and that he didn't bail on our friendship the first time I said I didn't ever want to date again but instead stuck it out to develop into a beautiful and fulfilling relationship. But I want to make it clear that the "moral of the story" here is not that you should hang around and be friends with people you like in hopes they'll eventually date you. Don't pressure people into dating you. 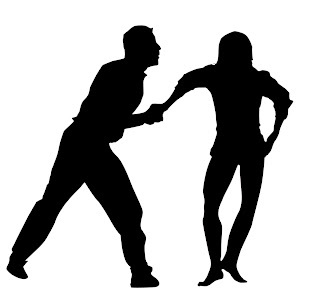 Respect people's boundaries and listen when they say "no." Friendships can turn into relationships, but you shouldn't expect them to. Defining the relationship is good when you're unsure what's going on. If your definition doesn't match the other person's, be cool about it. If another person is hesitant about something, it's better to assume they don't want to and be corrected than the other way around. Please share your own thoughts, stories, lessons, etc. in comments! This post contains an Amazon Affiliate link. 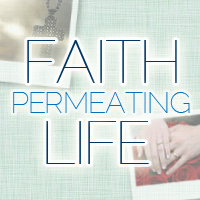 If you click on a book title and make any purchase at Amazon, your purchase will be supporting Faith Permeating Life. Thanks! When I was in college, I dealt with a "persistent" friend who I would've probably considered a stalker had we not been friends first. It took four separate conversations over a year and a half where, each time, I said "I do not want to date you" for him to finally understand that when I said "I do not want to date you," that's what I meant. Uggggh, I'm sorry you had to go through that. That is classic "Nice Guy" behavior, with an insidious Christian twist, and not a fun situation to be in. Unfortunately, I think conventional wisdom would say you should have "given him a chance," but why would you want to do that with someone who clearly doesn't respect your personal feelings or viewpoint and doesn't believe you when you say No? Yeah, and that is seriously some problematic thinking (that is unfortunately ingrained in the culture). That's why I write things like the Two Sides of the Same Coin post about how we need to trust people to make decisions about their own lives. Your clarification is important! I hadn't misinterpreted your story before, but I think you have a very good point about the strangely positive portrayals of excessive persistence in movies and why that isn't such a great approach in real life. (a) Because YOU said no and he listened, silly! (b) Now you are involved with THREE other men, two of whom are at this convention and sharing your hotel room, and do you REALLY want to make your life MORE complicated?! :-) So we never did get romantically entangled, but we are still friends, and now he's getting married, and I'm so much at peace with having missed this particular opportunity that I hadn't thought about it in years until I was back in that building. I certainly am glad he wasn't persistent. If he had any hopes about that dinner leading to anything, he didn't voice them; as far as I could tell, it was about catching up with each other since we lived in different cities by then and hadn't talked one-on-one in a few years. I had another male friend in college who was reasonably well-behaved but repeatedly made clear statements that he was attracted to me. It was getting on my nerves; I was starting to feel like I was "supposed" to stop rebuffing him. Finally one day he asked, "Why aren't you attracted to me?" and I burst out, "Because you're fat and have ugly teeth!!" and then I was mortified because that was so obviously rude and horrible. But he just laughed and said, "Good to know. I always wondered." and that was the end of it. Makes me wonder what he feared might be the problem! I wasn't too worried about readers here misinterpreting our story because I laid it out in such detail, but sometimes friends get the 5-sentence version of our story over lunch and I realized how it could sound. What's great about your first story is that because this guy was so respectful of what you had communicated to him, it allowed/required you to decide for yourself whether or not you wanted to be involved with him. If you'd been ambivalent and not had the chance to think it through, and he'd been overly persistent, you could have ended up in a situation that wasn't what you wanted at the time. Interesting that the second guy took your honest remarks so well! I always wondered myself why none of the guys I pursued in high school were interested in me, and I assumed it was because I wasn't physically attractive, but looking back I think it was just generally because I was so desperate for reciprocal attention -- and I'm not sure any of them could have articulated that to me. Probably the most important difference is the "nice guys" feel like a girl OWES them something. You know, since the nice guy gives her attention, gives her friendship, tells her he's interested, she is SUPPOSED to date him, or else she's being unfair. But in the case of you and your husband, he respected you and didn't act like he was entitled to anything (which is the right way to treat people!). Exactly! Even though Mike didn't stop being attracted to me, he clearly believed it was my choice whether or not I wanted to date him and that he had no say in the matter aside from making his own feelings known. I'm glad you posted this. Even though I didn't need the clarification of your story, per se, I'm glad the story of how respectful Mike was when pursuing you is out there on the web! It's a great example of something that's very much counter to our culture. I especially loved this endorsement from you: "Rather than stepping over my boundaries, he took them as law." What a wonderful basis this laid for your relationship. I hope your encouragements will help your readers hold out for partnerships that are just as much based on mutual respect and communication. I hope so too :) That's part of the reason I write about our relationship, to show others what's possible. I appreciated Emily's recent post on standards, which reminded me a bit of this older post of mine. Hmmm, interesting. This has made me reconsider the way I tell my story about how I ended up with my husband, since it was a sort-of similar situation. What I usually say is that I wasn't sure I was interested at first but he wore me down. Of course it's a very abbreviated version of events and I say it in a joking way, but it could certainly be taken the wrong way! In reality he definitely wasn't pushy and took the time to show me that he honestly cared about me, and similarly to you by the time he actually asked me out I had been a bit impatient for him to do so for a while!